AINW’s 1st Annual MLK Day of Service Holiday a Big Success! 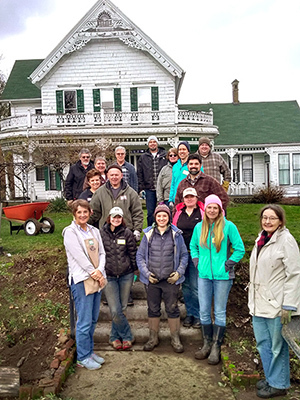 In keeping with their commitment to preserving Portland’s important historical landmarks, Jo, John, Terry, Nicholas, Maureen, Andrea, Shawn, Ron, Karla, Lexi, Kelley, Samantha, Jason, and Eva helped with landscaping, linen folding, inventorying, and other tasks for the Historic Zimmerman House Museum. Managed by the East County Historical Organization (ECHO), the Zimmerman House Museum is a beautiful turn-of-the-century farmhouse in East Multnomah County… and right down the street from AINW’s headquarters! 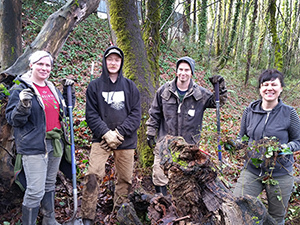 Meghan, Lea, Colin, and Joey spent the day helping to restore the health and beauty of Portland’s natural ecosystems. They removed ivy and cleaned up at the Indian Creek Natural Area, as part of the Johnson Creek Watershed Council’s MLK Day Habitat Restoration. Louis helped prepare home improvement items for the showroom at a Habitat ReStore. ReStores are home improvement stores that sell donated items, with the proceeds contributing to the work of Habitat for Humanity. Carmen spent the day at Nadaka Nature Park in Gresham planting trees, as part of the Friends of Trees mission to improve urban tree canopies. Carmen’s group—the Beaver Clan—did such a good job that they got the planting done sooner than expected, and moved on to pulling ivy, blackberries, and other weeds. Kristen assisted with produce bagging and quality control at the Oregon Food Bank. She also joined Hands On Greater Portland with SOLVE to pick up trash and help beautify the neighborhoods along Martin Luther King Jr. Boulevard. Honoring our History: A Public Art Dedication Ceremony from JLA Involve on Vimeo. AINW analyzed ancient tools from Jordan for Dr. April Nowell of the University of Victoria. The tools were from a sealed deposit that was 250,000 years old. Blood protein residues were detected on 17 analyzed tools. The positive results were from bovine, camel, duck, horse, and rhino. The technical article was published in the Journal of Archaeological Science.